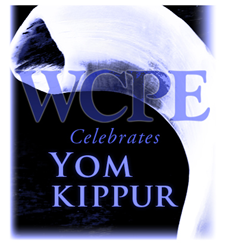 WCPE will offer special music for both the eve of Rosh Hashanah on Wednesday, September 20 and the eve of Yom Kippur on Friday, September 29. The program, Birth of the World, will be narrated by Leonard Nimoy. WCPE will offer special music for both the eve of Rosh Hashanah on Wednesday, September 20 and the eve of Yom Kippur on Friday, September 29. The program, Birth of the World, will be narrated by Leonard Nimoy. Rabbi Mark Cohn, Temple Emmanuel, Winston Salem, NC, will introduce the program and give a blessing at the end of the program. The programs air at 6:00 p.m. ET on those respective days, with encore airings to be announced. The Great Classical Music offered by WCPE transcends belief systems, being crafted by artists from all traditions, and listened to by a global audience reflective of the world’s diversity. Found throughout WCPE’s programming are the traditions of people from all walks of life. With a 39 plus year history, WCPE 89.7 FM is a non-commercial, 100 percent listener-supported, independent station dedicated to excellence in Great Classical Music broadcasting. WCPE is heard worldwide on the Internet in multiple formats, including the next generation IPv6. Because WCPE receives no tax-derived support, the station conducts two on-air fundraising campaigns and two major mail-out campaigns per year to raise needed operating funds. For more information, visit http://www.TheClassicalStation.org or call 919-556-5178.